Le Pocket Slapper est pratique et passe dans ta poche de pantalon. Il a juste la bonne taille pour bien travailler les parties des fesses qui nécessitent une attention "particulière". This paddle is as beautiful as it is mean. Just a couple of slaps with this paddle and your boy is going to start turning red. A few more and that beautiful purple hue will start to show. This little paddle from MEO was a perfect birthday gift. Delivers a nice sting and wonderful accompanying sound. Is nicely made. Good German quality. 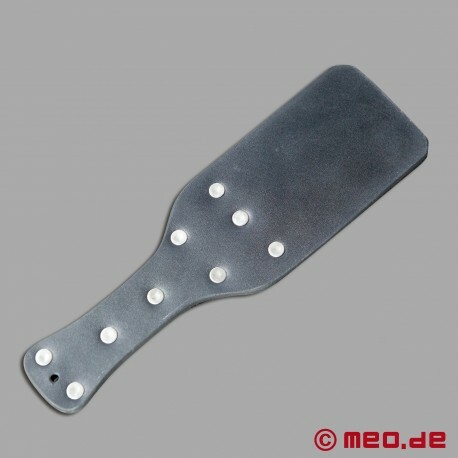 This spanking paddle is constructed of three heavy leather layers secured by rivets. Makes a nice sound on impact with good sting effects and eventual warming when that target area starts to change color. The appearance is very fetish like with the rivets of course. 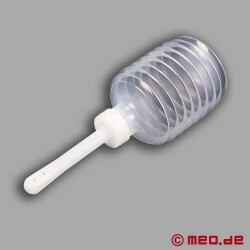 da er so kurz ist, kann mehr man beim schlagen sehr gut dosieren. Everyone that I have ever used this on has had to use their safety word!!! Stiff and strong and gets the point across. Not to be used unless you intend to take charge. This is the right size, the right shape, the right thickness and delivers the right amount of response when used correctly! It has been a huge "hit" at parties, and at clubs! Do yourself a favor and try it out! Great little paddle. The design allows to make quite a slap when it contacts the Mrs. cute little behind.